I'm going to break from my usual snarky blogging to help publicize an important effort on behalf of the Washington Humane Society. A friend of mine works for WHS and has recently been working to raise awareness in the case of Trooper, the pit bull who was found near death in a dumpster. This was most likely the result of dog fighting, the illegal and inhumane sport which is known to take place in private yards and basements around the DC area. Trooper underwent extensive emergency medical care at Friendship Hospital for Animals and was hospitalized for two weeks to save her life. She is now out of the woods and continues to improve, thanks to the efforts of dedicated people at WHS, and contibutions from people around the country. 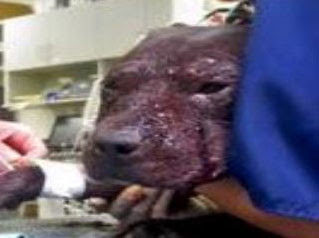 Unfortunately, dog fighting is still a fact of life in DC. There are always animals in need of emergency medical care, and WHS does not have the resources to pay for these expenses directly. Sophie's Fund was established to pay for emergency medical care for animals in need. Even though Trooper is out of the woods, the fund still greatly needs support. Please help if you can. This is so sad that people can submit such friendly animals to so much pain. I don't know how the people that do these things go to sleep at night.